Kolkata, April 13: In the backdrop of M.S. Dhoni's on-field argument with umpires, Chennai Super Kings will start as overwhelming favourites when they take on Kolkata Knight Riders (KKR) in an Indian Premier League clash at the Eden Gardens here on Sunday. Chennai captain Dhoni was fined 50 per cent of his match fee for an unprecedented confrontation with the umpires during their encounter against Rajasthan Royals in Jaipur on Thursday. 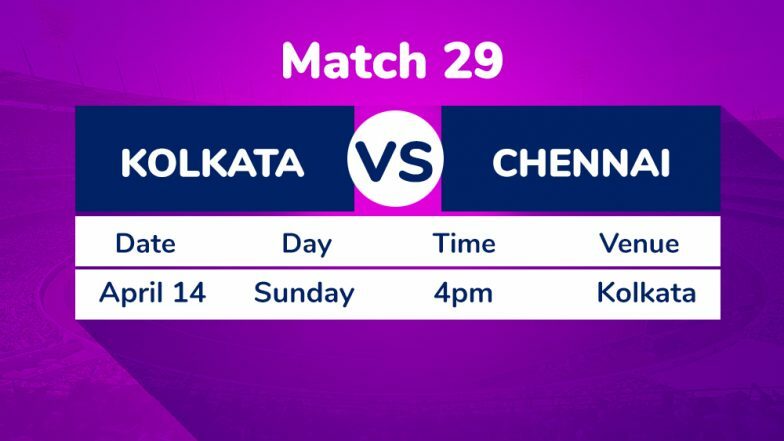 CSK Team in IPL 2019: Schedule and Squad Analysis of Chennai Super Kings in VIVO Indian Premier League 12. Former cricketers came down heavily on India's two-time World Cup winning captain, saying Dhoni's act set a wrong precedent. Chennai went on to win the match, their sixth victory in seven outings as they gunned down a modest 152 run target in a dramatic final over. KKR Squad in IPL 2019: Team Profile, Schedule of Kolkata Knight Riders in VIVO Indian Premier League 12. A sharp departure from his 'captain cool' image, it remains to be seen whether the first-of-its kind incident in Dhoni's career ruffles his feathers or not. Dhoni is also the team's highest run getter. Chennai have been playing as a unit with the likes of Faf du Plessis, Ambati Rayudu, Suresh Raina, Shane Watson and Kedar Jadhav all coming good in some matches or the other. Harbhajan has been the surprise package, taking seven wickets from four matches and finding himself inside the top-10 wicket takers' list. Russell has been the team's go-to man and his possible absence might hurt the home team big. Chennai Super Kings: MS Dhoni (captain & WK), Suresh Raina, Ambati Rayudu, Shane Watson, Faf du Plessis, Murali Vijay, Kedar Jadhav, Sam Billings, Ravindra Jadeja, Dhruv Shorey, Chaitanya Bishnoi, Rituraj Gaikwad, Dwayne Bravo, Karn Sharma, Imran Tahir, Harbhajan Singh, Mitchell Santner, Shardul Thakur, Mohit Sharma, K.M. Asif, Deepak Chahar, N. Jagadeesan (wk), Scott Kuggeleign.